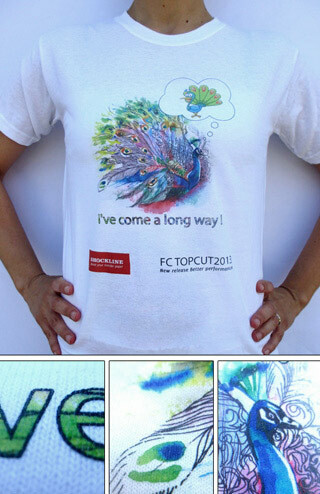 FC TOPCUT2013 03 is a new version of self-weeding transfer paper Shock Line for ligh colored fabrics. Suitable for any image. Ideal for flat or gradient colors (screening up to 30%). Transfer only toner-colored areas and gives a screen print hand and keeps the fabric’s natural feel. Cotton and other natural or synthetic white or light coloured fabrics.